This week we interview another highly experienced self-employed sales agent who is registered on CommissionCrowd. 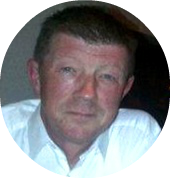 Colin Cornwall is a veteran self-employed (commission-only) sales agent with over twenty years experience in high end direct sales. You can find out more about Colin, as well as how to get in-touch with him in this week’s CommissionCrowd sales rep interview. Hi Colin, with over twenty years of sales under your belt, can you tell us where it all began? I’ve been in sales in one way or another most of my life. I started out in the fast paced advertising industry in the seventies and very quickly gained a good grounding & knowledge of every aspect of the sales process. I went on to become an account director in charge of a very large client account and so also learned how to spend money effectively & wisely. I eventually decided to pursue my dream of becoming self-employed and began my freelance sales career back in the eighties. I haven’t looked back since, and have been successfully selling everything from FMCG goods to Home Improvement products. I love it! Can you give us an insight into why you decided to leave full time employment and become a self-employed sales agent? First and foremost to make more money. Like any business owner I am an entrepreneur at heart and life as an employee simply wasn’t fulfilling my desire to work for myself anymore. I felt extremely confident that my experience and network of contacts that I had built up over the years would ensure I could hit the ground running. Life as an employee unfortunately restricts not only the amount of money you can earn, but also the time you have to spend it. I want to be in control of my own destiny and being able to manage my own time and diary. I’ve never enjoyed the restrictions of working from an office in the conventional sense and working a 9-5 job doing the same thing every day simply doesn’t motivate me. I like to spin a lot of plates at the same time and I love the daily challenge of selling to meet my customers needs while being able to enjoy the life I want to live. Do you have a particular achievement in sales that you are proudest of? My proudest achievement in sales to date is having been able to provide my family with a very good standard of living. I have achieved every sales target I’ve ever been set and I am especially proud of the fact that I have been able to contribute significantly more than has ever been expected of me. In your opinion can you tell us what sets a self-employed sales rep apart from a paid employee? Passion and determination. A self-employed sales rep is motivated every single day to sell and is always looking for ways to improve on the day before. I can’t remember a day ever passing without being inspired to seek new business. If we don’t sell we don’t make money it’s that simple! It’s also the fact that it’s your good name and reputation that is on the line not just the company you represent, it’s a partnership. What makes a commission-only sales opportunity attractive to self-employed sales reps? Firstly, there’s no limit to the amount you can earn as a successful commission-only sales agent. Ultimately you get out what you put in and that means the sky's the limit if you want it to be! I also look for companies who value their outsourced sales agents and recognise us as partners in their business, not employees. Honesty, integrity, great reputation and of course top quality products and Marketing materials are essential too. The biggest mistake a company can make is not to pay their agents on time. The ability to earn a recurring residual income is also very attractive to me. What excites you about using CommissionCrowd as an experienced self-employed sales rep? CommissionCrowd will make life so much easier for the company principal and commission-only sales agent as a great deal of time is spent and wasted looking for the right products and companies to represent. It also gives more structure and credence to the whole concept of a partnership between a company and a sales agent a place where both parties can feel confident and trust they’re getting the best advice. I am also very excited at the fact that I will be able to cut my workload in half using CommissionCrowd’s built in account management tools. Being able to make calls, send Emails, manage my sales pipeline, receive commission payments, send invoices as well as gain access to my company principal’s Marketing materials will make managing my workload and relationship with the companies I represent incredibly efficient. There are only so many hours in the working day and all I want to do is sell. CommissionCrowd will allow me to focus on closing more business while taking away all of the mundane business tasks which are usually associated with running your own business. Can you tell us what kind of opportunity you are currently looking for? I’m currently looking for a company who are in the direct sales industry. They must have quality high end products that require a dedicated sales professional to visit people in their homes or offices to sell the goods and earn a high level of commission. I have a lot of experience in the home improvements industry and I’m exceptionally proactive in finding new business. I am a highly motivated, responsible, hardworking person with many years of experience in direct sales with an excellent track record of achieving results and hitting targets. Known for my ability to relate to people and their needs, I am seeking a position in Field Sales where I can apply my sales experience and bring immediate value to your company whilst developing my current skills further.